Navigation: Home » Economics » Have Americans Started Driving Again? Have Americans Started Driving Again? Americans think 100 years is a long time. Europeans think 100 miles is a long distance. Probably no other quote, serious or otherwise, best sums up the American affair with the automobile. From the massive infrastructure projects undertaken in the United States to improve access by vehicle (like, say, the Interstate Highway System which first broke ground in the 50s) to the massive sprawl of American suburbs compared to our European counterparts, there is no denying the car culture of the United States. However, the recent Great Recession (the defining economic event of anyone who began their career after Black Monday) put a big dent into the ‘Americans will always embrace the open road‘ narrative. 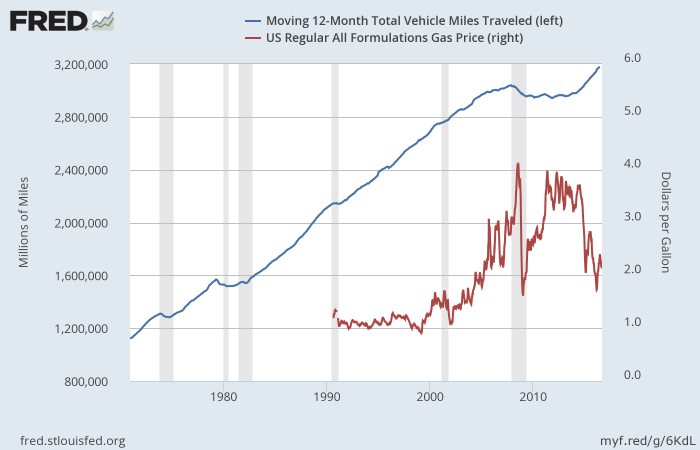 Declines in miles traveled lead to numerous hot takes about the “End of Driving” in the United States – $3+ gas and a plateau in miles driven did seem to interrupt the trip towards a collision with the upper right hand corner of the graph. Let’s take a road trip and visit the statistics as of today. Below is a graph of the moving 12 month miles traveled for the United States, via FRED (and data courtesy the Federal Highway Administration). We’ve mashed it up with the average fuel price across the United States, provided by the US Energy Information Administration. Miles traveled reached parity with pre-recession days in roughly January 2015, and we haven’t really looked back from that. Of course, gasoline prices have been volatile since mid-2007 – and, conveniently (and obviously), the most recent spike correlated with the plunge in gas prices back down to the ~$2.00 a gallon price. Perhaps this graph is just showing gasoline is more of an elastic product than we thought (contra the EIA), at least to some degree… or perhaps it’s just a sign that the recession is finally in the rear view mirror and we’ve shifted back into a higher gear. 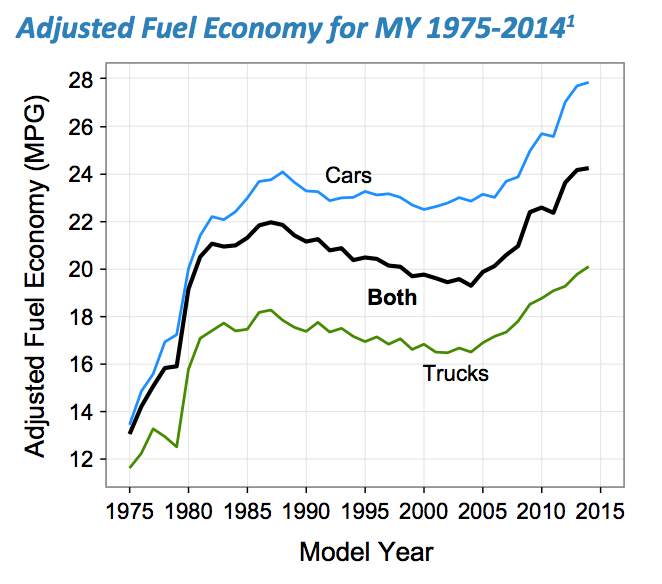 Add that to your internal narrative – could the increase in driving be related to the fact that, for the average car (or truck), the same amount spent on gasoline will push you down the road further? Whatever the reason, we’re back to the old pattern in the United States of traveling a record number of miles annually by vehicle. Eyeballing the graph, the most recent driving dip was really only similar to the pattern near the 1973 Oil Crisis and the 1979 Oil Crisis. That in mind, we can call this most recent dip the first time we had any sort of sustained slowdown in driving without having to label it an ‘Oil Crisis’. Regardless, it’s hard to make too many conclusions with an eye to future driving-beating-innovations. Perhaps trains will haul more freight, more workers will work remotely, automated cars will replace two vehicles in the garage and the default weekend trip won’t involve driving at some point in the future – but it appears, for now, that Americans are driving again. The car is still king, and the suburbs aren’t going anywhere for the moment. Let use know what you think we’re witnessing in the comments. Is it the last gasp of an outdated mode of transportation, or have the rumors of the death of driving been wildly exaggerated? Is it too late for Pigovians who wanted to use the dropping gas prices and reduced driving as an opportunity to raise gas taxes?